Typical ultrasonic immersible transducer installation. NTS Ultrasonics has developed an immersible ultrasonic transducer system intended for heavy duty ultrasonic cleaning. The system consists of a transducer assembly in a stainless steel housing that can be installed into new or existing cleaning tanks, and a companion electronics unit that drives the transducer assembly. The immersible transducer system can be installed on the bottom of a tank or on the side or ends, depending on the tank geometry. The standard system operates at 27kHz, but can be operated at higher harmonic frequencies. The electronic driver for the immersible transducers provides a frequency shifting system to break up standing waves, producing more uniform cleaning. The ultrasonic immersible transducer system has been designed with heavy duty continuous use in mind and is suitable for use in production cleaning lines. 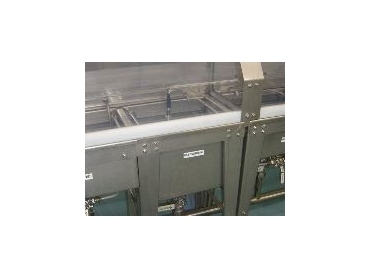 However, the system is also suitable for use as a convenient way to convert an existing non-ultrasonic cleaning bath into an ultrasonic cleaning bath, or converting any suitable existing tank into an ultrasonic cleaning system. NTS Ultrasonics can customise various aspects of the system design to suit individual ultrasonic cleaning applications, and high power ultrasonic applications other than cleaning.